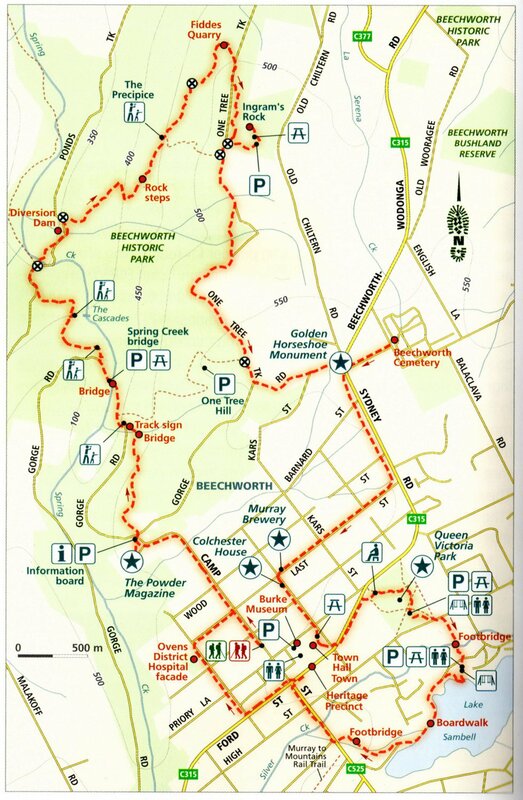 Beechworth Town and Country map. From Top Walks in Victoria. We parked the car at the top end of Camp Street and began walking up towards Beechworth Historical Park. The walk started well with a straight forward start with easy to find tracks and some brilliant sights such as the Beechworth Powder Magazine, the Spring Creek bridge and The Cascades. We easily crossed Spring Creek at the ford and began walking north east roughly along Ponds Track. The text says “stay on Ponds Track until you see a green wooden sign about 30m into the scrub…”. The sign is not visible from Ponds Track and you have to go up a barely obvious track to the right to find the sign. At first I thought “30m into the scrub” meant 30m along Ponds Track so the text can be ambiguous at times. Once I found the green sign I went up a very steep track thinking it was the correct way. It wasn’t until the others returned and after much shouting I came back down and then realised I had went the wrong way. I missed the one lonely arrow on a small post. The track is obvious at the post but it quickly fades. The text says this part of the track is barely used; but the book is dated 2014 and the information was probably gathered a couple of years before that making the map almost five years old; and a lot can change in that time. After failing to find a way through we went back to Ponds Track and continued on. But this is a long way around (it goes off the above map) and we missed Ingram’s Rock at the top. Instead of being on One Tree Hill track I had to ask a forest worker to find out we were on Old Chiltern Road. Too tired to back track to Ingram’s Rock we continued on and turned right onto Gorge Road to get back to the car, completely skipping the “town” part of the walk. We drove to the Beechworth Bakery and had a very late and well deserved lunch at 3pm. Having missed out on these two sights the next day we drove instead of walking to Ingram’s Rock and Fiddes Quarry. After 3km of walking we saw it all, as well as the sign for the missing link between The Precipice and Ponds Track. In hindsight it would have been better to have turned around after taking in the beautiful scenery at The Cascades and walked up the track (dotted line on the map and where the boys turned up by mistake) towards One Tree Hill and then onto Ingram’s Rock and back down to do the town part of the walk.